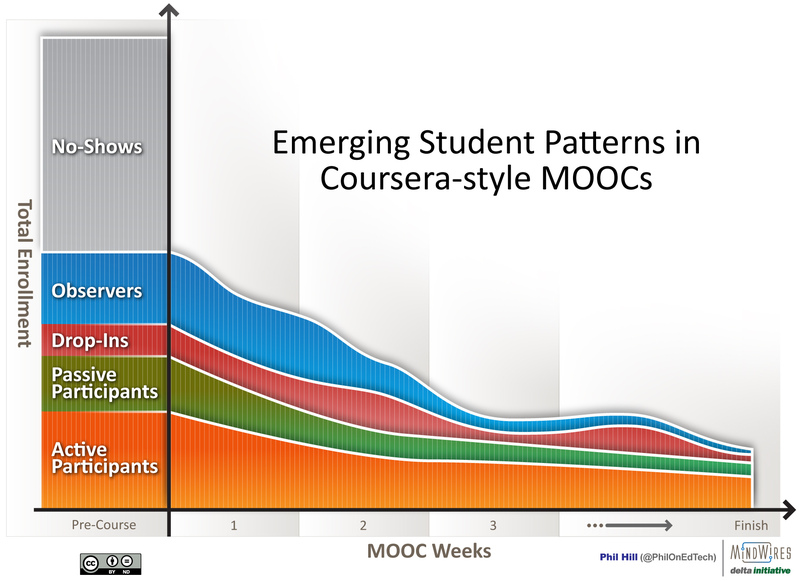 In part 1 of this series of posts on MOOC student patterns, I shared an initial description of four student patterns emerging from Coursera-style MOOCs based on new data from professors. In part 2, I revised the description based on some feedback and added a graphical view. The excellent feedback has continued, primarily through comments to both posts mentioned above as well as a separate Google+ discussion. This process has helped identify a fifth pattern, clarify the pattern description, and improve the associated graphic. In particular, I want to thank Debbie Morrison, Colin Milligan, John Whitmer, Charles Severance and Kevin Kelly - as well as other commenters for the great discussion. The primary changes involve clarifying the previously-described Lurker category. I have separated out a new No-Show category and renamed the Lurkers as Observers. There are also tighter descriptions of each pattern that help define potential data collection that would identify these groupings. Here are the new descriptions and updated graphic. No-Shows – These students appear to be the largest group of those registering for an Coursera-style MOOC, where people register but never login to the course while it is active. Observers – These students login and may read content or browse discussions, but do not take any form of assessment beyond pop-up quizzes embedded in videos. Drop-Ins – These are students who perform some activity (watch videos, browse or participate in discussion forum) for a select topic within the course, but do not attempt to complete the entire course. Some of these students are focused participants who use MOOCs informally to find content that help them meet course goals elsewhere. Passive Participants – These are students who view a course as content to consume. They may watch videos, take quizzes, read discuss forums, but generally do not engage with the assignments. Active Participants – These are the students who fully intend to participate in the MOOC and take part in discussion forums, the majority of assignments and all quizzes & assessments. I guess you’ve already put considerable time in your categorization of student behaviour patterns in MOOCs. But I would still like to point you to a framework that might be appropriate and fit your questions and research data. The ‘Reader-to-Leader’ framework is developed by Jennifer Preece and Ben Shneiderman (The Reader-to-Leader Framework: Motivating Technology-Mediated Social Participation). As the authors indicate. it might be used in several disciplines and domains. So education (especially tailored from a social-constructivist perspective) could also benefit from the insights this framework can support.